The black forest is a picturesque, wooded mountain range in southwestern Germany. It is bordered by the Rhine Valley to the West and South and is home to many famous rivers including the beautiful Danube. Due to the abundance of available wood, mostly firs and pines, the Black Forest was famous for all sorts of woodwork, as well as the famous Black Forest Ham and Black Forest Cake. One of the renowned wood-crafts for centuries has been clocks. The coo coo clock is a wonderful, historic time keeper that can trace its roots all the way back to Greece! The first "coo coo clock" was owned by Ctesibus, a mathematician living in Alexandria around 250 BC. His clock used water to set off a whistle and cause a small model of an owl to move every hour. Through the centuries, there have been other accounts of clocks with birds announcing the time designed in Europe and the Middle East. The coo coo clock as we know it today began early development in Europe in the 1600s. 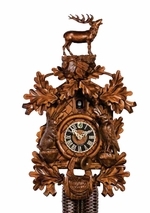 There are many accounts of who invented the modern coo coo clock, but the clock we know and recognize today was developed by the German people living in the Black Forest. The Black Forest region of Germany is famous for its wood crafts. They picked up the coo coo clock and soon made it their own. Today, the coo coo clock mechanism that makes the clock tick and the bird call remains basically the same as it was way back then. Coo coo clocks have a rich history behind them that make them a fun and educational "old world" time keeper. Cuckoo clocks quickly became more elaborate. Longer songs, different tunes for different hours, and oil paintings or beautiful lattice work adorned the front as times and styles changed. Mechanisms got smaller and smaller or louder and louder and made for amazing, beautiful pieces that matched the local arts. The moving parts also became more elaborate, allowing for multiple moving figures or birds that rocked back and forth while flapping and singing. There were contests like the one hosted by the Grand Duchy of Baden Clockmakers School in 1850 that pushed the cuckoo clock into even better development and aesthetic appeal.